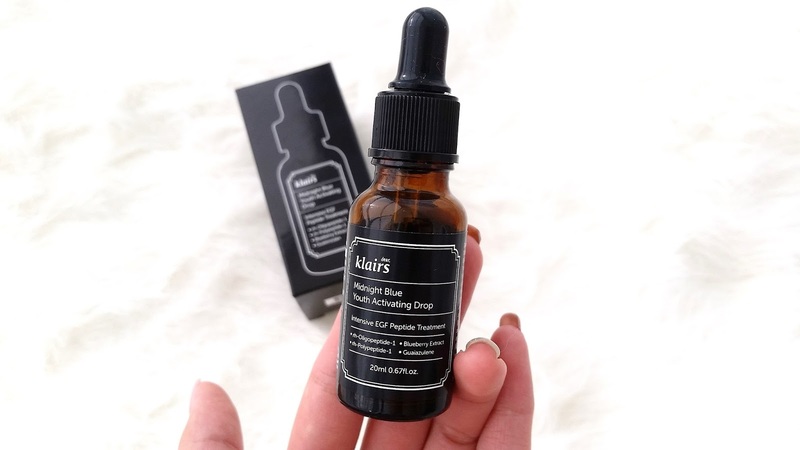 Product Description: The Klairs Midnight Blue Youth Activating Drop is an anti-aging serum that can delay aging, minimize the appearance of fine lines, improve skin texture, repair damaged skin, and strengthen the skin's barrier. 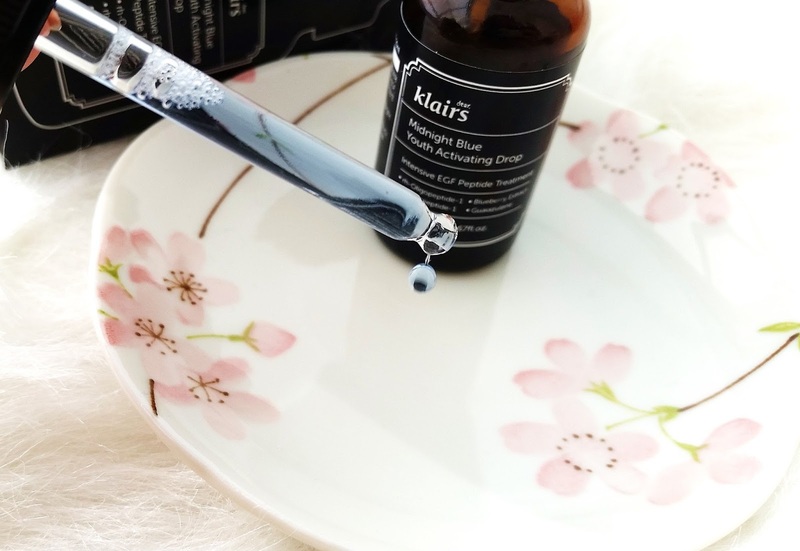 It's a concentrated serum that contains only 10 ingredients, 95 percent of which are raw ingredients that contributes to its skin care abilities to delay aging. 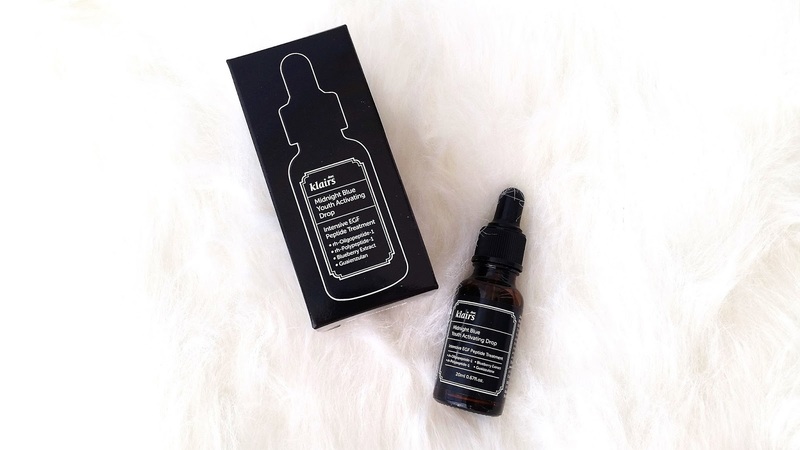 The star ingredients in this Youth Activating Drop are EGF (RH-Oligopeptide- 1) and bFGF (RH-Polypeptide- 1), both of which are known to improve skin elasticity, texture, and tone. 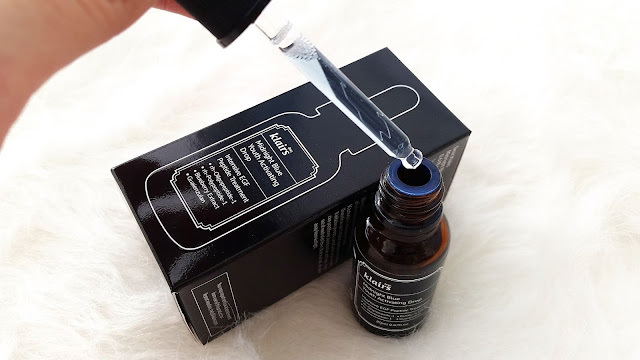 The other ingredients in the serum add to its skin care benefits with moisturizing effects and antioxidants that can improve the overall health and quality of the skin. To Use: In the evening, cleanse the skin first. Apply 3 to 4 drops of the serum onto the face and pat gently to let it absorb. Optional: apply an additional drop onto targeted areas to strengthen the effects. Ingredients: RH-Oligopeptide- 1, RH-Polypeptide- 1, Butylene Glycol, Vaccinium Angustifolium (Blueberry) Fruit Extract, Sorbitan Sesquioleate, PEG-60 Hydrogenated Castor Oil, Chlorphenesin, Guaiazulene, Ethylhexylglycerin, Adenosine. Ingredient Spotlight: The star ingredients in this Youth Activating Drop are no doubt the EGF (RH-Oligopeptide- 1) and bFGF (RH-Polypeptide- 1). Both ingredients are key factors that are crucial to the skin's elasticity, texture, and tone. EGF stands for Epidermal Growth Factor, which works by binding to its receptor (EGFR) to stimulate cell growth and differentiation. This effect helps to regenerate skin and has excellent effects on minimizing fine lines that forms during the 20s to 30s. As for bFGF, it stands for Basic Fibroblast Growth Factor which is present in the basement membranes and it's a member of the FGF family. This has the effects to help with wound healing as well as collagen and elastin production. The body itself naturally produces substances called EGF and bFGF. However, in the your mid-20s the concentration of EGF decreases rapidly and the amount of collagen the skin produces also drops as well. Adding on the environmental damages and UV damages that can destroy essential elements of skin health, the skin's slow production of EGF and bFGF can't react at the same rate as before in healing the skin. Which can result in decreased skin elasticity, loss of firmness, and formation of fine lines and wrinkles. This is why products with EGF and FGF are helpful during this period, as it can slow down the signs of aging. Other notable ingredients are Guaiazulene, blueberry extract, and adenosine. Guaiazulene is the same ingredient found in Klair's Blue Cream and it's known to be highly effective in the recovery of damaged skin as well as its ability to soothe sensitive skin. Blueberry extract is rich in antioxidants that can help to improve the appearance of fine lines and slow down aging. Finally, adenosine is a functional ingredient with anti-aging benefits. It can boost the levels of proteins such as collagen and elastin in the body which helps to slow down aging and reduced the appearance of wrinkles as well. Packaging: The sleek black box packaging with white writing seen above stores the bottled Youth Activating Drop. Its design is clean and it has information about the product in both English and Korean. The serum itself is stored in a dark brown tinted dropper bottle, which is typical for concentrated products like these. The bottle also has information printed on it, which includes the expiration date. Scent: Although there's no added fragrance in the serum, there is still a light scent to it. It's really faint and hardly noticeable in my opinion, unless you stick your nose right up to the bottle opening. It's a little hard to describe the scent because it's not something as simple as say strawberry or apple. I think the scent is likely caused by one or few ingredients and it smells a little chemical like, not in a bad way though. However, as mentioned above, the scent is hardly there so unless you really dislike the scent, you should have no issues with this product scent wise. Color: A beautiful blue. You can see its color in the pictures above and below. It is transparent, so you can see right through it but everything on the other side will look blue thanks to its natural blue tint. I really like this color as it gives off a calming feel. Texture: Liquidy like water. Its watery texture can make it a little hard to control, especially if you are like me and doesn't want to put it on the palms of your hands before patting it in. (I like to drop serums, essence, etc. in droppers straight onto my face and pat it in that way.) However, I've found a little trick that can help. The trick is to tilt your head slightly back and then apply the drops, one area at a time. This way, the drops will take longer to roll down and it'll give you plenty of time to pat it in. Michelle's Thoughts: When I first laid eyes the Youth Activating Drop, I fell in love with its color. The see-through blue gives off a calming effect that looks visually pleasing. The product itself is pretty good as well and so far I've been very satisfied with it. Personally, I feel like this serum is best for those (like myself) who needs/wants a preventative product rather than a way to reverse signs of aging. If you have deep set wrinkles, this is not going to do much. However, if you want a product that can improve elasticity, slow down aging, and minimize the appearance of new or light fine lines, this is it. Right now I'm in my 20s and in terms of aging I've noticed the decrease of elasticity in my skin as well as the formation of some light fine lines. To me, this is like a warning from my skin and it prompted me to add in some anti-aging products to my routine to boost elasticity, minimize damage, and slow down aging. I was eager to try the Youth Activating Drop as its promises to delay aging, minimize the appearance of fine lines, improve skin texture, repair damaged skin, and strengthen the skin's barrier are just what my skin needs right now. Plus, it only contains 10 ingredients so it's like a concentrated dose of goodness for the skin. After a month's use, I've found the best way for my skin to use this product and seen the awesome effects it provides. I like to apply this serum right after I cleanse my face and before I apply toner. I found this to be more effective than applying it after toner. I use 5 drops: one on the forehead, one on each cheek/side of face, one of the nose, and one on the chin. Once patted in, I like to go back and apply an additional drop on my forehead area, as that's where my light fine lines are. Afterwards, I'll continue on with the rest of my routine. 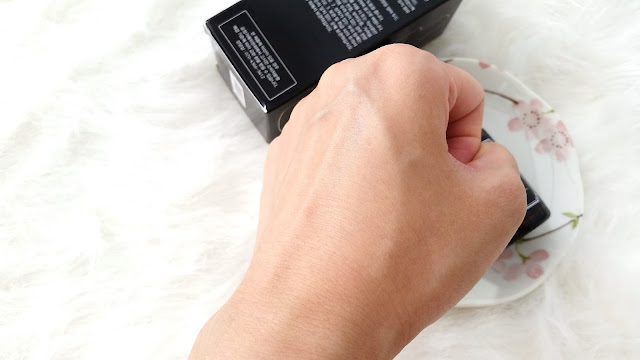 I've found this to be the most effective way to apply the product for my skin and the additional drop on the forehead adds some extra effects in minimizing those fine lines. As for its skin care effects, I've noticed that my skin overall is smoother and the texture is more refined. My skin feels softer, plumper, and more elastic than before. No doubt the product is helping to heal my skin, strengthen its barrier, and slow down its aging process. Also, the light fine lines on my forehead are less noticeable than before. They aren't completely gone but my hope is that with continued use of this product it'll help to increase elasticity in that area and decrease the appearances of fine lines even more until it's hardly noticeable or gone. Since those are light fine lines, they aren't set in stone and can still be erased with care. Final Thoughts: The improvements I've seen over a month of using this product has been great. While it's not a cure all, it is a product that can help to delay aging, improve skin texture, minimize the appearance of fine lines, heal damaged skin, and strengthen the skin barrier. For my skin I've noticed the effects of all of those mentioned above, some more so than others. It's my hope that with continued use I would see even better results, especially with minimizing fine lines. Would I purchase it in the future? Most likely. 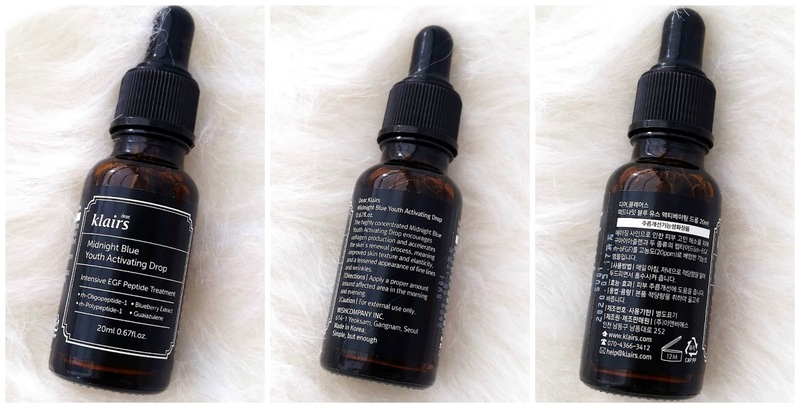 The Youth Activating Drop's concentrated dose of effective ingredients will delay aging, heal the skin, strengthen its barrier, increase its elasticity, and improve its texture. Who can say no to that amazing combo of skin care benefits? Do I think this product is worth a try? Yes! Especially if preventive effects such as slowing down aging are what you are looking for. 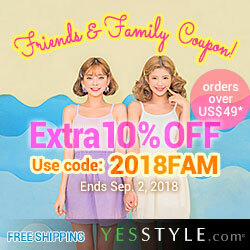 Use Wishtrend's special codes for more savings! This month get their Vitamin 75 Maximizing Cream for free (pay shipping only) with code WISHMAX. Find more discount codes on our deals and steals page!